Can’t keep a good merc down. After the announcement hit that the long awaited Deadpool flick was now fast tracked, in production and starring big screen funny man Ryan Reynolds, fans waited eagerly to see how this would shape up. One major factor is, of course, the costume. Deadpool, the merc with a mouth anti-hero from Marvel Comics, is known for his iconic red and black costume. But with films, sometimes comic accurate costumes are disregarded completely (hi, movie Hawkeye), so it was on the mind of Deadpool fanatics everywhere. 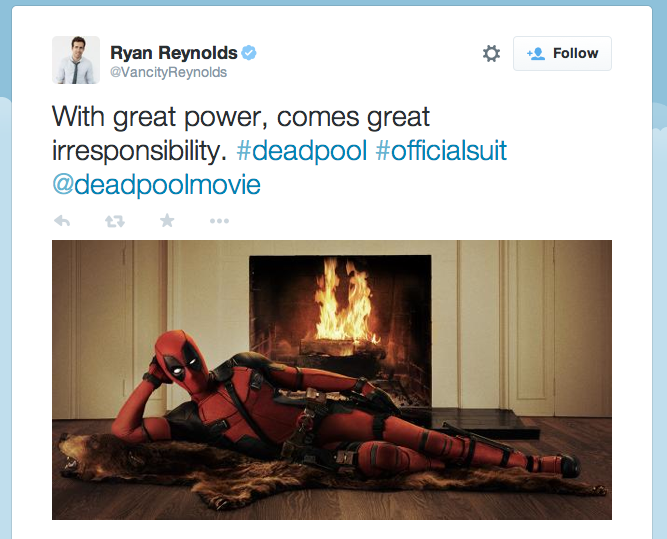 Well, Ryan Reynolds has put your fears to rest. Via Twitter (Reynolds social media outlet of choice it seems when it comes to Deadpool), Reynolds revealed a “bear all” photo, showing off the official costume for the Deadpool movie. And… what do you know, it looks spot on to his comic book counterpart! Weigh in everyone, does this work? Why? Why not? Just be happy it’s not the Deadpool from the second half of Wolverine Origins… yeah, thankful indeed.